6th - 11th January - At sea for Shakedown. 12th January - Rendezvous with escorts for CARIBTRAIN deployment. 1st February - Arrive in Barbados. 2nd February - Captain Michael Harris joins as new Commanding Officer. 3rd February - Captain Weatherall departs. 9th February - Depart from Barbados. 20th - 21st February - Anchor off Tortola, British Virgin Islands for beach banyans. 24th - 28th February - Visit to San Juan, Puerto Rico. 7th - 16th? March - Visit to Mayport, Florida for Short Maintenence Period and station leave. 23rd - 27th? March - Visit to Charleston, South Carolina. 9th April - Portsmouth for Short Maintenance Period (SMP) and Easter leave. May - ASW Exercises in North Western Approaches. 25th - 29th May - Staff College Sea Days. 2nd June - Sail from Portsmouth. 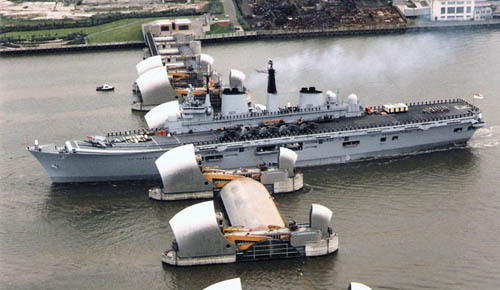 3rd June - Pass through Thames Barrier to anchor off Greenwich. 8th June - White Ensign Association charity banquet held in the hangar and on the flight deck. Guest of honour, Princess Alexandra. 9th June - Informal visit by Her Majesty Queen Elizabeth the Queen Mother. 10th June - Sail from Greenwich. 12th June - Arrive Rosyth. 13th - 14th June - Rosyth Navy Days. 16th June - Sail from Rosyth. 16th - 25th June - Joint Maritime Course (JMC). 26th - 29th June - Rosyth. 29th - 30th June - Exercise HADRIAN'S WALL. 3rd July - Families Day. Event includes filming of a song & dance routine by Grace Kennedy with the Nigel Lithgoe Dancers for an August edition of ITV's Summertime Special. 13th July - Commence Docking and Assisted Maintenance Period (DAMP). 18th August - Move from dry dock. 29th - 31st August - Portsmouth Navy Days. 1st - 4th September - Shakedown and Post-Maintenance Trials (at sea). 6th - 11th September - Royal Navy Equipment Exhibition (at sea). Includes visit by HRH Prince Michael of Kent. 14th September - Sail from Portsmouth for Shakedown and preparations for COST. 22nd September - Commence Continuation Operational Sea Training (COST) at Portland. 11th October - FOST Final Inspection, COST complete. 14th - 21st October - Aviation Work Up. 21st - 23rd October - Operational Readiness Inspection. 23rd October - Portsmouth for Self Maintenance Period (SMP). 2nd November - Sail from Portsmouth. 4th - 19th November - Exercise PURPLE WARRIOR. December - Base-Assisted Maintenence Period (BAMP) and Christmas leave.